I don't really know what this dish actually called. So, I just keep it sweet and simple. Here, I present a way that Mexican cooks their rice with flavours added. 1. Heat frying pan over high heat, add oil and garlic, cook until brown not burnt. 2. Add onion, cook until transparent. 3. 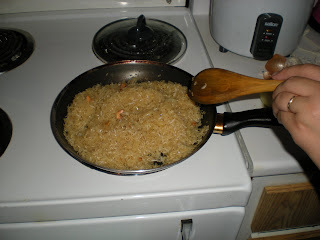 Add uncooked rice and stir constantly until colour change not burnt. 4. 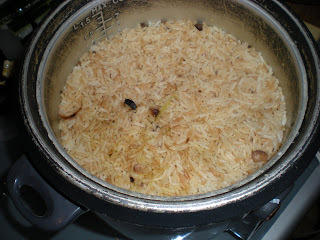 Transfer rice to a rice cooker. Putting your hand on the surface of the rice, pour enough warm water until it covers your hand. Let it cook until ready.